The system was specified for the hall by Fred Vogler, principal of Sonitus Consulting. To John Meyer, president and CEO of Meyer Sound, music is a lifelong love that drives his quest for perfect sound. His goal is to capture the essence of the music—so that audiences focus on the artistry, and not the technology that delivers the sound. “When we hear all the incredible musicians playing through our systems and see the audience completely enthralled by the performances, we feel the satisfaction of knowing we’ve done something good for the music and for everyone involved,” said Meyer. 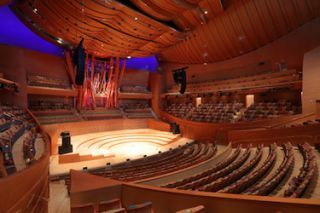 The new Meyer Sound configuration includes twin arrays of 14 LEOPARD line array loudspeakers and three 900-LFC low-frequency control elements each, aimed for optimum reach throughout the hall. A Galileo Callisto loudspeaker management system handles system drive and alignment.